The first couple of weeks of November are always busy for LGB Brass, and this year was no exception. We kicked things off at Lewes bonfire on the 5th – our second bonfire of the season, having been part of festivities at Hailsham a couple of weeks earlier. Commercial Square Bonfire Society, as ever, made us very welcome, and the unseasonably warm weather meant we had a pleasant evening processing round the town. Some of us even ended the evening in short sleeves, not something that’s ever happened before! The Pankhurst Anthem by Lucy Pankhurst, narrated by Jane Humberstone, to commemorate the 100th anniversary of the Representation of the People Act, which gave women over 30 the right to vote for the first time. As ever we had excellent support from the office of the Mayor of Lewes, who not only provided us with the use of the Assembly Room at the Town Hall, but also printed our programmes, helped to publicise the event, and provided the refreshments. In attendance were the Lord-Lieutenant of East Sussex, Mr & Mrs Peter Field, the High Sheriff of East Sussex, Major General John Moore-Bick CBE DL, the Mayor of Lewes Cllr Janet Baah, the Chair of Lewes District Council Cllr Stephen Gauntlett, MP for Lewes Maria Caulfield, and a number of other Councillors from both Lewes Town and Lewes District Councils, as well as Jack Neil, representing the Royal British Legion. We would like to thank them all for their support of the band. Sunday, as you might expect, was a rather more sombre occasion, and the band was once again honoured to support the remembrance services arranged by the Royal British Legion in both Ringmer and Lewes. At Ringmer we led the traditional parade to the War Memorial, and then provided music for the service at St Mary the Virgin. Our flugel player (and occasional bass drummer) Alex Emberley provided the Last Post and Reveille to bookend the impeccably observed silence. In Lewes we led the parade to the War Memorial, accompanied the laying of wreaths with the traditional Nimrod, and the Last Post was delivered by cornet player Adam Kearley. 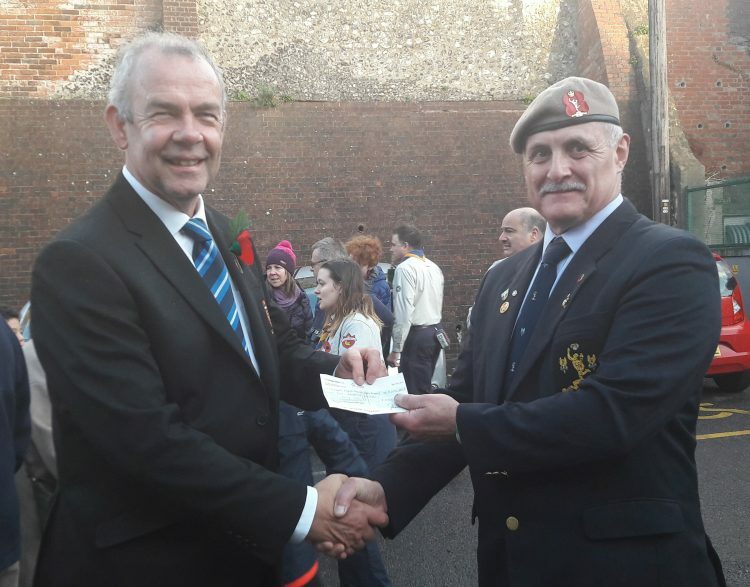 It is always a privilege to support these events, even more so this year, as we were able to present Alan Mayers of the Royal British Legion with a cheque for £400, the proceeds of our leaving collection from Saturday’s concert. The Christmas music makes its first appearance this week, so keep an eye out for us on the streets of Lewes in the run up to the big day. Our traditional concert for the Lewes Lions takes place on 4 December, and then we’ll be out and about for late night shopping on the 6th.